It’s not clear whether Kumar is being directly replaced. Currently, Mel Guymon, an ex-Googler who joined Yahoo in March 2013, lists himself on LinkedIn as VP of search products, small business and partner platforms. Update: Yahoo has provided us with its own confirmation and an update of who is replacing him. 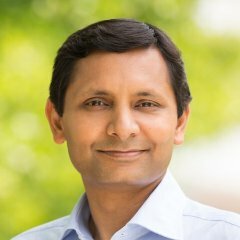 Kumar joined Yahoo in 2013 when the Internet portal acquired his e-commerce app startup Lexity — part of CEO Marissa Mayer’s very long string of acquisitions to boost the company’s talent and product ranks. Lexity was subsequently rebranded as Yahoo Small Business and run by Kumar. It was his second stint at Yahoo; he had been an engineering manager and then director of product management at the company between 2005 and 2008. The news comes after Yahoo reported a mixed set of quarterly earnings that were buoyed less by a turnaround at the business and more by healthy returns in the IPO of e-commerce giant Alibaba. Last week Yahoo also announced the appointment of a new VP for sales in North America, Lisa Utzschneider, who it hired away from Amazon. Lexity came to Yahoo with customers, which it continued to serve, although there haven’t been a lot of other new launches to build out the original product line, which offers e-commerce, website creation, and marketing/advertising services. Separately, we heard that Yahoo at one point considered selling off its small business division. More broadly, Yahoo has also been going through a gradual series of closures, layoffs and consolidations. A lot of those most recently have been focused on in its international operations. It made 400 layoffs in India, and it has downsized elsewhere, too, with executive and other workforce departures in other parts of Asia, the closure of offices in Jordan and Hungary and confirmation that there may be yet more consolidation in the EMEA region.